Update: In an email to Club delegates, the Clubs Council Executive have revealed that the debt repayment grant is “non-compliant with … SSAF requirements” under national legislation and is therefore invalid. The non-compliance was determined by the ANUSA legal team before the recent Council meeting but the Council Executive was unaware of this due to “a miscommunication” between ANUSA and the Clubs Council. It is now unclear how and if the Science Society will be bailed out. The Science Society has incurred a debt in the range of $2000-$5000 which it has been unable to repay. In response, the Clubs Council has instituted a new grant for the express purpose of debt repayment. Zachari Lord, Clubs Council Funding Officer, told the Council that “substantial debt [was] incurred by the Science Society after their ball” held on August the 18th. 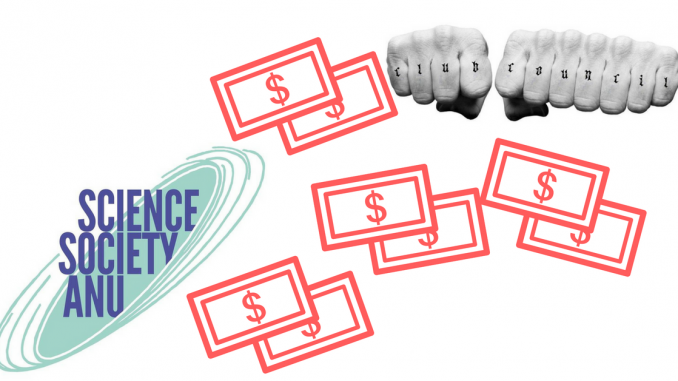 The Science Society (SciSoc) bailout will be paid from the club funding pool, which has approximately $50 000 left for grants in term four. The pool is drawn from SSAF, the fee all students pay to service campus activities. Balls are “highly risky endeavors”, Lord said in defence of the payment. This was questioned by Debating Society Delegate James Richardson who argued “it’s not easy to overrun” by more than $500. “If you’re screwing up by more than this,” Richardson maintained, “there’s something else going on.” Bodie D’Orazio, seconded by Richardson, moved to limit the grant to $500, which would have left SciSoc debt unpaid, however the amendment was rejected. Lord said the new debt repayment grant aimed to “avoid students being directly liable” for debts incurred by societies. “We don’t think [students] should be [liable], even if it is their fault,” he added. The Council executive was insistent that SciSoc be supported, and Council Secretary Joel Baker told Observer he understood that the Executive had “received advice suggesting that the Council would be unable to avoid paying this debt”. It is unclear whether the debt could have forced SciSoc to wind up their society. Lord and Baker agreed that Clubs would typically wind up when in arrears, but Lord specified, “It’s not an automatic thing. From my understanding, a society dissolves once it can’t get any new executive members.” Lord speculated that a club in debt would be unlikely to attract any executives. The Executive had earlier put a motion to the Council to expand reprimand measures for Clubs who “grossly mismanage” their affairs, Community Officer Lewis Pope said. Pope denied that the change was “aimed at any particular club”. Astronomy Society Delegate Shankar Ravikumar moved an amendment to authorise the retrospective use of new discipline provisions in relation to the repayment of debts. Baker had previously informed the Council that the Executive “will not have grounds to reprimand the Science Society” as it could not apply retrospectively, and encouraged such an amendment. Pope accepted this as a friendly amendment, and it was therefore passed without debate. Concern was raised that this grant could create perverse incentives. Richardson suggested it could encourage Clubs to “just burn piles of money”, knowing ANUSA would bail them out. ANUSA Social Officer and Council Chair Cameron Allan denied this, arguing that while “it reduces the risk associated with someone going into debt”, he does not “think this is enough of an incentive”. Neither the Science Society nor its President Dan Wang have responded to repeated requests for comment at time of publication. The Society did not appear to be present at the Council meeting.